The crazed, homicidal machines at Aperture Science have taken the time out of their busy schedule of rectifying the living to wish the world a Happy (Holiday Name Here.) 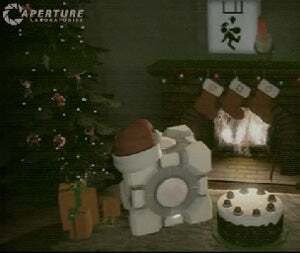 It's a testament to the power of the Portal experience that even now, a year and several months after completing the game, a holiday rendition of Still Alive and a picture of a Weighted Companion Cube next to a Christmas Tree can get me all sniffling, remembering the joys of games past. You just want to wander right into the little clip and hug the Cube, mindless of the turret hiding in the corner. Damn you, Aperture Science, and Happy (Holiday Name Here). Live From Holiday Vault 07 [Aperture Science - Thanks Joel!] Update - Yes, it's from last year, but the happy little holiday feeling remains.